L-iżvilupp tas-sit preżentement okkupat mill-Istitut tal-Istudji Turistiċi f’Pembroke reġa’ fl-aħbarijiet. Is-settur pubbliku jipprovdi l-art filwaqt li l-Grupp dB jimpala l-euro, bil-miljuni. Matul din il-ġimgħa l-media tkellmet dwar il-miljuni li qed jiġi miftieħem li jitħallsu għall-bejgħ eventwali ta’ sulari sħaħ fit-torrijiet tal-Grupp dB. Dawn m’humiex flejjes li ser jitħallsu għal xiri ta’ propjetà fuq il-pjanta, għax s’issa la hemm permessi u l-anqas għad m’hemm l-ebda pjanta ffinalizzata. L-awtoritajiet tal-ippjanar għadhom fl-istadji inizzjali fl-eżami tagħhom tal-proġett propost: l-Awtorità għall-Ambjent u r-Riżorsi (ERA) għadha kif bdiet il-proċess ta’ konsultazzjoni statutorja dwar l-Istudju tal-Impatt Ambjentali (EIA) li għandu għaddej sat-12 ta’ Frar. Minkejja li l-ERA għad tista’ tirrakkomanda tibdil, żgħir jew kbir, fil-proġett wara li tkun ikkunsidrat bir-reqqa l-EIA, qiesu li l-iżviluppaturi huma ċerti li mhu ser ikun hemm l-ebda konsiderazzjoni ta’ ippjanar jew ambjent li ser ixxekkel dak li bosta jqiesu li hu proġett żejjed u mhux meħtieġ. Id-dokumenti ppreżentati għall-iskrutinju pubbliku huma sostanzjali u voluminużi. Imma possibilment fihom in-nieqes u għaldaqstant diġa ktibt lill-Awtorità tal-Ambjent u r-Riżorsi biex tirrimedja u tippubblika dak li ġie identifikat bħala nieqes s’issa. Dokument ta’ interess li insibuh fuq is-sit elettroniku tal-ERA huwa l-Project Description Statement (PDS) li tħejja minn ditta (partnership) ta’ periti li ftit kienet magħrufa s’issa. Din id-ditta iġġib l-isem ta’ Landmark Architects u jirriżulta li titmexxa mill-ekx-Ministru tat-Trasport il-Perit Jesmond Mugliett. Fil-paġna 5 ta’ dan id-dokument, il-Perit Mugliett jikteb hekk “Nhar it-2 ta’ Frar 2017, il-Gvern u s-soċjetà dB San Gorg Property Limited iffirmaw il-kuntratt għat-trasferiment tal-art li dwarha ħarġet sejħa pubblika għall-proposti. Kemm il-Gvern ta’ Malta kif ukoll is-soċjetà dB San Gorg Property Limited jaqblu li l-evalwazzjoni tal-proġett ta’ żvilupp m’għandhiex iddum iktar mill-perjodu minimu stabilit mill-leġislazzjoni tal-ippjanar. (On the 2nd of February 2017, the Government of Malta and dB San Gorg Property Limited signed the contract for the granting of the RFP site. Both the Government of Malta and dB San Gorg Property Ltd. agree that evaluation of the project development should not extend beyond the minimum time frames established by Planning Law.) Fil-fehma tiegħi dan ifisser li l-Gvern diġa rabat idejn l-Awtorità tal-Ippjanar dwar kif din għandha topera f’dan il-kaz. Dan, fil-fehma tiegħi jimmina l-proċess ta’ konsultazzjoni pubblika. Għax liema huma r-regoli u policies tal-ippjanar li l-Awtorità tal-Ippjanar ser isegwi fuq is-sit illum okkupat mill-Istitut tal-Istudji Turistiċi? Il-proposta diġa tidher ċar li tmur kontra dak li jipprovdi l-pjan lokali tal-2006 li hu applikabbli. Allura fuq liema kriterji ser tkun ivvalutata l-proposta ta’ żvilupp? Xi żmien ilu konna infurmati li l-ebda żvilupp fl-inħawi m’hu ser jitħalla jibda sakemm ikun konkluż Masterplan ġdid għal Paceville. Dakinnhar kien emfasizzat li l-proposti dwar is-sit tal-ITS f’Pembroke seta jkun evalwat biss wara l-approvazzjoni tal-Masterplan ġdid għal Paceville. Din hi wegħda li kienet skartata kompletament! Kien ukoll ġie mwiegħed li l-Masterplan il-ġdid ma kienx ser ikun imniġġes minn kunflitti ta’ interess. Tgħid din il-wegħda ser tkun injorata ukoll? The redevelopment of the site currently occupied by the Institute for Tourism Studies (ITS) in Pembroke is again in the news: the public sector is providing the land while the dB Group will rake in the profits – amounting to millions of euro. During the week various media outlets focused on the millions being forked out for the eventual purchase of entire floors in the dB Group towers. These are not the price for purchase of property still on plan, because no permits have yet been issued, nor have the plans as yet been finalised. The examination of the proposed development by the planning authorities is still in its initial stages: the Environment and Resources Authority (ERA) has just kicked off the Environment Impact Assessment (EIA) statutory consultation period, which is scheduled to run until 12 February. Notwithstanding the fact that the ERA may recommend changes to the planned project as a result of its consideration of the EIA, it seems that the developers are sure that there will be no planning or environmental issues which can put the breaks to what most people consider an ill-advised project. The documents presented for public scrutiny are voluminous, but possibly incomplete, and I have already written to ERA to complete the missing information gaps, at least those identified to date. A basic document of interest, available on the ERA website, is the Project Description Statement (PDS) – the work of an as yet unknown partnership of architects going by the name of “Landmark Architects”. It transpires that this partnership is headed by former Transport Minister Jesmond Mugliett, who writes on page 5 of the PDS : “On the 2nd of February 2017, the Government of Malta and dB San Gorg Property Limited signed the contract for the granting of the RFP site. Both the Government of Malta and dB San Gorg Property Ltd. agree that evaluation of the project development should not extend beyond the minimum time frames established by Planning Law.” To my mind this signifies that the government has already tied the Planning Authority’s hands as to how it should operate in this case. Does this not undermine the whole consultation process? What planning rules and/or policies will the Planning Authority follow at the former ITS site? On what criteria will the development proposal be evaluated – it already clearly goes beyond what is permitted in the applicable 2006 local plan. Some time ago, we were informed that no new developments in the area would be given the go-ahead until such time as a new draft Paceville Master Plan was launched. It was then emphasised that the proposals for the Pembroke ITS site can only be properly assessed when the Paceville Master Plan is in place. This pledge has been blatantly ignored by the development proposal. It was also pledged that the new proposed Master Plan will not be tainted by conflicts of interest as was the original one. Will this pledge also be ignored? It is pretty obvious that the primary – and possibly the only – objective that the Nationalist Party seeks to attain through its proposed “coalition” is to numerically surpass the Labour Party when the first count votes are tallied after the forthcoming general election. Should this materialise, it could be a stepping stone on the basis of which, possibly, it could return to office on its own or in coalition. The rest, that is to say beyond the first count vote tally, is all a necessary evil for the PN. In contrast, Alternattiva Demokratika’s objectives go beyond arithmetic. Alternattiva Demokratika favours a principle-based coalition, ethically driven, in conscious preference to a pragmatic-based one that is driven exclusively by arithmetic considerations. A principle-based coalition asks questions and demands answers continuously. The path to be followed to elect the first Green MPs is just as important as the objective itself. This is not simply a minor inconsequential detail: it is a fundamental difference in approach. Alternattiva Demokratika is continuously being tempted to discard its principled approach on the basis of a possible satisfactory result being within reach: now is the time, we are told, to join Simon Busuttil’s coalition in the national interest. Alternattiva Demokratika has always given way to the national interest. It is definitely in the national interest to discard (at the earliest possible opportunity) the two-party system that is the cause of the current political mess. In this context, at AD we do not view the PN (or the PL for that matter) as a solution. Both are an intrinsic part of the problem. Even if they are not exactly equivalent, together they are the problem. Parliament has been under the control of the two-party system without interruption for the past 52 years. This is ultimately responsible for the current state of affairs as, due to its composition, Parliament has been repeatedly unable to hold the government of the day to account. It is the worst kind of political dishonesty to pretend that the PN is whiter than white when criticising the Labour Party’s gross excesses during the past four years. Labour has been capable of creating the current mess because the last PN-led government left behind quasi-toothless institutions, such that, when push came to shove, these institutions were incapable of biting back against abuse in defence of Maltese society: so much for the PN’s commitment to good governance. 1) Claudio Grech’s incredible declaration on the witness stand in Parliament’s Public Accounts Committee that he did not recollect ever meeting George Farrugia during the development of the oil sales scandal, George Farrugia being the mastermind behind it all. 2) Beppe Fenech Adami’s role in the nominee company behind the Capital One Investment Group/Baltimore Fiduciary Services . In quasi similar circumstances, former Labour Party Treasurer Joe Cordina was forced to resign and was withdrawn as a general election candidate. 3) Mario DeMarco’s error of judgement (with Simon Busuttil’s blessing) in accepting the brief of Silvio Debono’s db Group in relation to the provision of advisory legal services on the Group’s acquisition from Government of land at Pembroke, currently the site of the Institute for Tourism Studies, and this when his duty a Member of Parliament was to subject the deal to the minutest scrutiny and thereby hold government to account. 4) Toni Bezzina’s application for a proposed ODZ Villa at the same time that, together with others, he was drafting an environment policy document on behalf of the PN in which document he proposed that this should henceforth be prohibited. 5) Simon Busuttil’s alleged attempt to camouflage political donations as payment for fictitious services by his party’s commercial arm, thereby circumventing the Financing of Political Parties Act. How can the Nationalist Party be credible by declaring itself as the rallying point in favour of good governance and against corruption when it took no serious action to clean up its own ranks? Apologies are a good start but certainly not enough: heads must roll. A coalition with a PN that closes more than one eye to the above is bound to fail, as the behaviour of the PN and its leadership is clearly and consistently diametrically opposed to its sanctimonious declarations. These are very serious matters: they need to be suitably and satisfactorily addressed as a pre-condition to the commencement of any coalition talks. Time is running out and this is being stated even before one proceeds to identify and spell out the red lines – ie the issues that are non-negotiable. Addressing the arithmetic issues concerning the general election and then ending up with a “new” government with such an ambivalent attitude to good governance would mean that we are back to the point from which we started. Nobody in his right mind would want that and Alternattiva Demokratika would certainly not support such double speak. 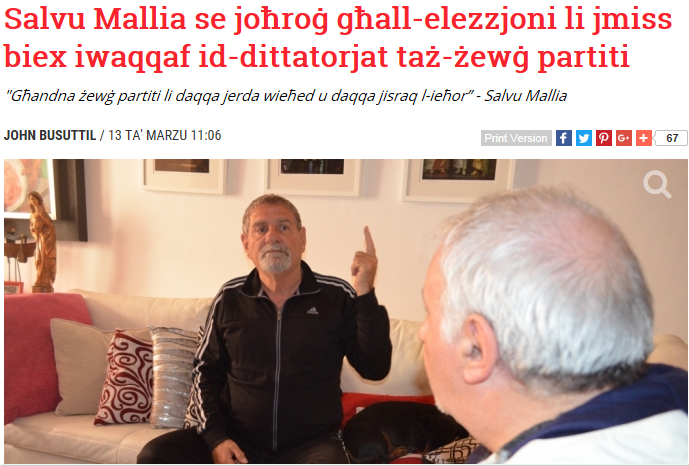 Id-dibattitu pubbliku dwar jekk, meta u kif għandha tkun żviluppata alleanza elettorali bejn Alternattiva Demokratika u l-Partit Nazzjonalista qabad ritmu sewwa fuq il-media soċjali matul il-ġimgħa li għaddiet. Dan seħħ l-iktar bħala riżultat tal-intervista ta’ Michael Briguglio fuq din il-gazzetta l-ġimgħa l-oħra. Il-veduti ta’ Michael Briguglio, bla dubju, jirriflettu l-esperjenzi tiegħu u jwassluh għall-konklużjoni li t-toroq li jippuntaw lejn alleanza elettorali (jew kif ġieli nirreferu għaliha, koalizzjoni) għandhom ikunu eżaminati sewwa u mingħajr wisq dewmien. Jiena m’għandi l-ebda għaġġla. Dan qed ngħidu minħabba li l-imġieba tat-tmexxija tal-Partit Nazzjonalista hi ta’ tħassib mhux żgħir u li bħala riżultat ta’ dan qed nifforma l-opinjoni li wara kollox jista’ jkun li dan mhux il-mument addattat għal inizjattiva ta’ din ix-xorta. Il-kobba mħabbla dwar id-donazzjonijiet li qed tiżviluppa bejn il-Partit Nazzjonalista u Silvio Debono tad-db Group tirrikjedi li jitqegħdu l-karti kollha fuq il-mejda biex ikun assigurat li l-fatti kollha huma magħrufa. Kemm hu veru li l-PN irċieva donazzjonijiet moħbija bħala ħlas għal serviżżi li ma nagħtawx u dan billi għamel użu mill-kumpanija kummerċjali tiegħu? Apparti l-grupp db kemm-il entitá kummerċjali oħra hemm li għamlet din it-tip ta’ donazzjoni moħbija lill-PN? Dan kollu ma jmurx kontra dak li l-PN ilu jgħid żmien dwar is-suppost tmexxija serja li jrid? Allura jekk anke fuq xi ħaġa bażika bħas-serjetá fit-tmexxija l-PN jgħid ħaga u jagħmel oħra kif qatt nistgħu nemmnu u nagħtu piż lil dak li jgħid il-PN dwar prinċipji u kwalunkwe xorta ta’ proposta politika? Hemm diversi materji oħra li jinvolvu l-imġieba ta’ membri parlamentari ewlenin tal-Partit Nazzjonalista li dwarhom tinħtieġ li tingħata spjegazzjoni. Per eżempju d-dikjarazzjoni ta’ Claudio Grech li ma jiftakarx jekk qatt iltaqa’ ma George Farrugia, u dan fil-kuntest tal-iskandlu taż-żejt, xejn ma tikkonvinċi. L-aċċettazzjoni da parti tal-Kap tal-Opposizzjoni ta’ din id-dikjarazzjoni tixhed dubju fuq kemm qiegħed jiffunzjona l-kumpass etiku tant meħtieġ u essenzjali għal min appunta lilu nnifsu fit-tmexxija tal-koalizzjoni kontra l-korruzzjoni. L-anqas ma huma ċari l-affarijiet fejn jidħol ir-rwol ta’ Beppe Fenech Adami fil-Capital One Investment Group u l-Baltimore Fiduciary Services. F’sitwazzjoni kważi identika, Joe Cordina, dakinnhar Teżorier tal-Partit Laburista, kien imġiegħel jirreżenja. Min-naħa l-oħra Mario de Marco għamel apoloġija pubblika dwar il-ġudizzju żbaljat tiegħu meta huwa aċċetta l-inkarigu mill-Grupp db dwar l-akkwista ta’ l-art f’Pembroke fejn illum hemm l-Istitut għall-Istudji Turistiċi. F’dawn iċ-ċirkustanzi, bla ebda dubju, apoloġija mhux biżżejjed. Irridu nikkunsidraw ukoll il-villa proposta biex tinbena barra miż-żona tal-iżvilupp minn Toni Bezzina kelliemi għall-agrikultura tal-PN u flimkien ma oħrajn awtur tad-dokument dwar il-politika “ġdida” ambjentali tal-PN. Proposta li tmur kontra dak kollu li kien propost fid-dokument. Il-Kap tal-Opposizzjoni flok ma tajru immedjatament ipprova jeħilsu billi qal li “ma għamel xejn ħażin. Meta tqies kollox, tista’ tifhem aħjar kemm it-tmexxija tajba u l-iġieba etika huma bosta drabi nieqsa fost l-Opposizzjoni. Kull wieħed minn dawn il-kazijiet, anke jekk meqjus għalih waħdu, kien ikun iktar minn biżżejjed biex tkun xkupata l-barra t-tmexxija kollha tal-Opposizzjoni. Kif tista’ Alternattiva Demokratika taħdem favur alleanza elettorali ma’ partit politiku li t-tmexxija tiegħu hi kompromessa b’dan il-mod u għandha daqstant x’tispjega dwar l-imġieba tagħha? Kif jista’ l-Partit Nazzjonalista jippretendi t-tmexxija morali ta’ koalizzjoni kontra l-korruzzjoni qabel ma jagħti spjegazzjoni konvinċenti tal-imġieba tal-esponenti ewlenin tiegħu? Il-fatt li l-Partit Laburista għandu ħafna iktar x’jispjega mhu ta’ l-ebda konsolazzjoni u bl-ebda mod ma jiġġustifika l-imġieba tal-Opposizzjoni. Il-mintna li jinsab fiha pajjiżna hi riżultat dirett tat-tmexxija tal-Partit Laburista tul dawn l-aħħar erba’ snin. Imma hi ukoll riżultat tas-sistema ta’ żewġ partiti politiċi li iktar ma tispiċċa malajr, iktar aħjar għal kulħadd. Is-sistema ta’ żewġ partiti li kkontrollat il-makkinarju tal-istat bla interruzzjoni mill-1966 sal-lum hi responsabbli ukoll għas-sitwazzjoni attwali. Dan minħabba li bħala konsegwenza tat-tip ta’ Parlament li ġie elett kien prattikament impossibli (b’xi eċċezzjonijiet żgħar) li dan jeżamina b’reqqa l-ħidma tal-Gvern b’mod li jkun imġiegħel jagħti kont ta’ egħmilu bis-serjetá. Filwaqt li l-ħolqien ta’ alleanza elettorali tista’ tkun ta’ ġid għall-pajjiż, iċ-ċirkustanzi preżenti ma naħsibx li jipprovdu l-mument addattat. Il-bibien għad-diskussjoni Alternattiva Demokratika żżommhom dejjem miftuħin imma bħalissa hu l-mument li wieħed joqgħod attent biex ikun evitat li jingħataw messaġġi żbaljati. Huwa biss meta jkunu ċċarati l-affarijiet li jkun il-mument addattat biex jittieħdu d-deċiżjonijiet dwar il-jekk u l-kif ta’ alleanza elettorali. 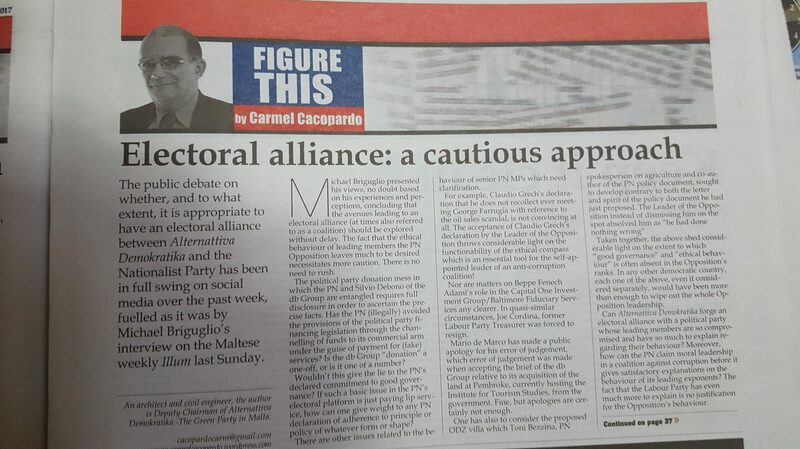 The public debate on whether, and to what extent, it is appropriate to have an electoral alliance between Alternattiva Demokratika and the Nationalist Party has been in full swing on social media during the past week, fuelled as it was by Michael Briguglio’s interview on the Maltese weekly Illum last Sunday. Michael Briguglio presented his views, no doubt based on his experiences and perceptions, concluding that the avenues leading to an electoral alliance (at times also referred to as a coalition) should be explored without delay. The fact that the ethical behaviour of leading members the PN Opposition leaves much to be desired necessitates more caution. There is no need to rush. The political party donation mess in which the PN and Silvio Debono of the db Group are entangled requires full disclosure in order to ascertain the precise facts. Has the PN (illegally) avoided the provisions of the political party financing legislation through the channelling of funds to its commercial arm under the guise of payment for (fake) services? Is the db Group “donation” a one-off, or is it one of a number? 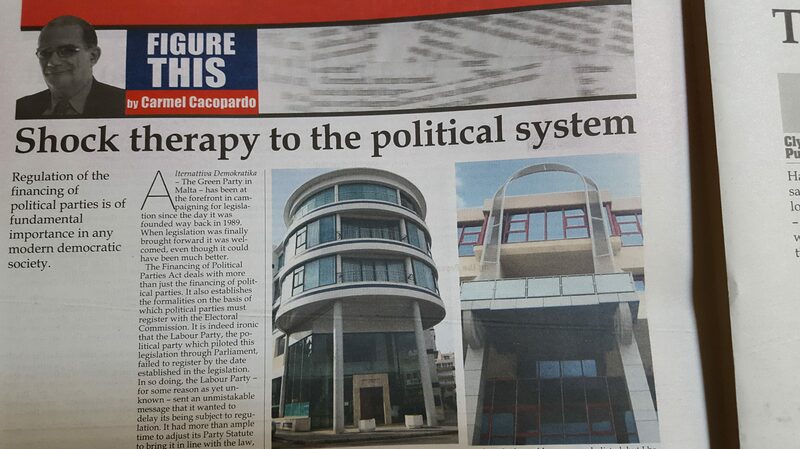 Wouldn’t this give the lie to the PN’s declared commitment to good governance? If such a basic issue in the PN’s electoral platform is just paying lip service, how can one give weight to any PN declaration of adherence to principle or policy of whatever form or shape? There are other issues related to the behaviour of senior PN MPs which need clarification. For example, Claudio Grech’s declaration that he does not recollect ever meeting George Farrugia with reference to the oil sales scandal, is not convincing at all. The acceptance of Claudio Grech’s declaration by the Leader of the Opposition throws considerable light on the functionability of the ethical compass which is an essential tool for the self-appointed leader of an anti-corruption coalition! Nor are matters on Beppe Fenech Adami’s role in the Capital One Investment Group/Baltimore Fiduciary Services any clearer. In quasi similar circumstances, Joe Cordina, former Labour Party Treasurer was forced to resign. Mario DeMarco has made a public apology on his error of judgement, which error of judgement was made when accepting the brief of the db Group relative to its acquisition of the land at Pembroke, currently hosting the Institute for Tourism Studies, fro the government. Fine, but apologies are certainly not enough. One has also to consider the proposed ODZ Villa which Toni Bezzina, PN spokesperson on agriculture and co-author of the PN policy document, sought to develop contrary to both letter and spirit of the policy document he had just proposed. The Leader of the Opposition instead of dismissing him on the spot absolved him as “he had done nothing wrong”. Taken together, the above shed considerable light on the extent to which “good governance” and “ethical behaviour” is often absent in the Opposition’s ranks. In any other democratic country, each one of the above, even if considered separately, would have been more than enough to wipe out the whole Opposition leadership. Can Alternattiva Demokratika forge an electoral alliance with a political party whose leading members are so compromised and have so much to explain as to their behaviour? Moreover, how can the PN claim moral leadership in a coalition against corruption before it gives satisfactory explanations on the behaviour of its leading exponents? The fact that the Labour Party has even much more to explain is no justification for the Opposition’s behaviour. The mess in which the country is currently submerged, the direct result of Labour Party stewardship over the past four years, is also the direct consequence of a two-party system which needs to be smashed to smithereens. The two- party system which has controlled the machinery of the state uninterruptedly since 1966 is ultimately responsible for the current state of affairs as it has continuously returned a Parliament which, due to its composition, has, with insignificant exceptions, been unable to hold the government of the day to account. While the setting up of an electoral alliance could eventually be beneficial to the country, in the present circumstances it is not the right time to rush. At this point in time, linking Alternattiva Demokratika to the PN through an electoral alliance may send wrong messages. While Alternattiva Demokratika will never close the doors to possible discussions on an electoral alliance, I believe that it is certainly the season to be extremely cautious until such time as the murky waters have cleared. It is only then that the time would be ripe for the necessary decisions. Regulation of the financing of political parties is of fundamental importance in any modern democratic society. Alternattiva Demokratika – The Green Party in Malta – has been at the forefront in campaigning for legislation since the day when it was founded way back in 1989. When legislation was finally brought forward it was welcomed, even though it could have been much better. The Financing of Political Parties Act deals with more than just the financing of political parties. It also establishes the formalities on the basis of which political parties must register with the Electoral Commission. It is indeed ironic that the Labour Party, the political party which piloted this legislation through Parliament, failed to register by the date established in the legislation. In so doing the Labour Party – for some reason as yet unknown – sent an unmistakable message that it wanted to delay its being subject to regulation. It had more than ample time to adjust its Party Statute to bring it in line with the law, but it procrastinated for more than twelve months. Earlier this week, the Electoral Commission announced that it would be setting up a Board to investigate allegations of breaches of the Financing of Political Parties Act that have been brought to its attention. As far as is known there are three such alleged breaches. The first breach is that brought forward by Alternattiva Demokratika and involves the use of public property by the Labour Party Parliamentary Group for holding one of its recent meetings. I have already written about the matter in the 26 February edition of TMIS (Joseph tweets a selfie from Girgenti). On Friday the Secretary-General of Alternattiva Demokratika Ralph Cassar was informed in writing that AD’s request for the Electoral Commission to investigate the use of the Girgenti Palace by the Labour Party Parliamentary Group will be taken in hand by the Investigation Board established for the purpose. We are so used to the use and abuse of public property by the major political parties that it has, over the years, been considered a fait accompli, taken for granted. It may be a “minor abuse” compared to others in the news, but we cannot tolerate even the smallest breach of the provisions of the Financing of Political Parties Act. The second breach is the one highlighted by the Labour Party regarding the Silvio Debono donations to the Nationalist Party. Silvio Debono has clearly spilled the beans in retaliation to the PN criticism of the ITS land at Pembroke being transferred for peanuts. It is an issue of fake invoices and tainted donations as described in my article in this newspaper last week. The whole case rests on the existence of possible fake invoices by which illegal donations to the Nationalist Party could have been channelled through its commercial arm. If the investigating board is presented with the fake invoices, which Silvio Debono says he paid on prodding by senior members of the PN leadership, it is difficult to fathom how the PN can avoid carrying the responsibility for the matter. The third breach has been highlighted by the PN, obviously against the Labour Party. It refers to a number of One journalists who have been selected to occupy positions of trust in various Ministries and authorities. The PN complaint list may have some mistakes, as some names are most probably erroneously listed, but I believe that it is correct to point out this corrupt practice through which the Labour Party media are being subsidised through state salaries – i.e. through the taxes that we pay. The fact that these three alleged breaches will be investigated under the auspices of the Investigating Board appointed by the Electoral Commission is a step forward. However, it all depends on those selected to carry out the investigation. I look forward to some shock therapy to the political system as I consider all three complaints to be justified. It is about time that both the Labour Party and the Nationalist Party are brought to their senses and made to realise that they, too, are subject to the law. But then, maybe I am hoping for too much from the Investigating Board! Għamel tajjeb il-Kap tal-Opposizzjoni li rrefera t-trasferiment tal-art f’Pembroke fejn hemm l-Istitut għall-Istudji Turistiċi għand l-Awditur Ġenerali għal investgazzjoni, għax dan hu trasferiment li fih bosta irregolaritajiet. Ftit ħin wara li Simon Busuttil għamel id-dikjarazzjoni li ser imur għand l-Awditur Ġenerali huwa irċieva SMS li biha ċ-CEO tal-kumpaniji ta’ Silvio Debono talbu lura l-flus li kienu ngħataw bħala donazzjoni lill-PN. Hu ċar għal kulħadd li dan m’għamlux b’rispett lejn il-liġi, jew minħabba li jrid is-serjetá, iżda bi tpattija immedjata. Kuntrarjament għal dak li qal il-Kap tal-Opposizzjoni dan ma kienx rikatt iżda ritaljazzjoni għal dak li kien diġa intqal. Imma bħala riżultat ta’ din ir-ritaljazzjoni min-naħa ta’ Silvio Debono, sirna nafu mingħand l-istess Debono li fl-2016 huwa kien intalab jagħmel ħlasijiet ta’ €70,800 għal servizzi li ma kellux bżonn imma li kienu ser iservu għall-ħtiġijiet ta’ Partit Nazzjonalista. Debono żied jgħid li tħejjew invoices u ħallashom. Ħadd ma jista’ jeħodha kontra l-Kap tal-Opposizzjoni li mar għand l-Awditur Ġenerali biex dan jinvestiga dak li jidhru li huma irregolaritajiet kbar. Imma bla dubju dan il-pass tajjeb ta’ Simon Busuttil ma jikkanċellax l-abbużi li qed ikun allegat li saru dwar donazzjonijiet lill-Partit Nazzjonalista li ukoll jeħtieġu li jkunu investigati. Huwa ovvju li Debono mhux qed jitkellem għax iħobb l-ordni, is-serjetá u l-osservanza tal-liġi. Imma jekk dak li qed jgħid Debono seħħ, u nistennew li jkunu prodotti l-provi dwar dan, dan huwa abbuz gravi u jeħtieġ li jkun investigat. Dan mhux tfettieq kif qed jippruvaw jgħidu x’uħud. Jekk dak li qed jgħid Debono seħħ ifisser li nkisru l-iktar prinċipji bażiċi tal-liġi dwar il-Finanzjament tal-Partiti Politiċi. Nistenna li ma ndumux ma naraw kopja tal-irċevuti u l-kontijiet li nħarġu biex jiġġustifikaw il-ħlas. L-istorja ma tieqafx hawn. Għax dan kollu għandu konsegwenzi li m’humiex żgħar. Jekk ippruvat, dan ifisser li l-Partit Nazzjonalista jipprietka s-serjetá fil-pubbliku, imma imbagħad, fejn ma jidhirx, jagħmel mod ieħor. Jekk ippruvat dan ifisser li hi illużjoni li naħsbu li wara dawk l-uċuħ mimlija qdusija hemm min għandu rieda tajba. Ifisser fuq kollox li filwaqt li qatt m’għandna nagħlqu l-bibien għal ħadd, irridu noqgħodu b’seba’ għajnejn il-ħin kollu għax bejn dak li jidher u dak li hemm fil-fatt tezisti differenza kbira. Għax kif tista’ tippreżenta front wieħed u magħqud kontra l-korruzzjoni jekk min jilgħaba tal-paladin tal-imġieba tajba jgħid mod fid-deher u jagħmel ieħor meta ma jidhirx. 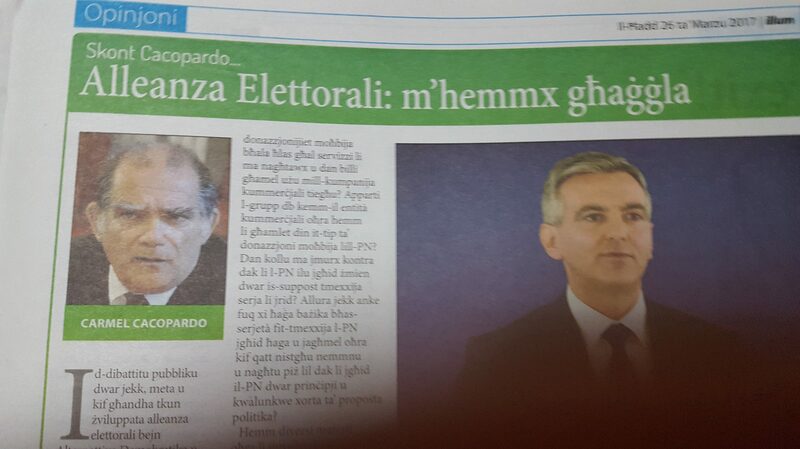 Mhux kulħadd għandu fiduċja għamja f’Simon Busuttil bħalma għandu Salvu. Dak jaħseb li l-maħmuġ jista’ xi darba jirreklama l-indafa. Erħilu li sa ftit ilu kien konvintissimu li m’hemmx x’tagħżel bejn il-PN u l-PL. Imma issa ikkonverta u donnu nesa’ kollox. Dak li naraw b’għajnejna u mmissu b’idejna ma nistgħux ninjorawh. Il-ħmieġ jibqa’ ħmieġ, jagħmlu min jagħmlu. Imma meta jitwettaq minn min jagħmel il-ġurnata kollha jipprietka l-indafa, tajjeb ukoll li jkun ċar li mhux qed jirnexxielu jgħaddina biż–żmien.